With Nigeria ranking 189 in healthcare service provision among the 191 World Health Organisation (WHO) member countries, pharmacists have attributed the country’s poor performance to failure of doctors to adjust to global changes in health administration. The pharmacists who spoke under the platform of Pharmaceutical Society of Nigeria (PSN) counselled doctors under the umbrella body of Nigerian Medical Association to embrace global practices in healthcare service management and delivery. PSN blamed NMA for the poor WHO ranking of the country and the prolonged intractable disagreement among professionals in the sector, following the latter’s claims that health administration and leadership is the preserve of doctors. But, the association praised Mr. Akinwunmi Ambode, the governor of Lagos state for the recent creation of pharmacists’ consultancy cadre in the Scheme of Service of Lagos state, saying that it is a step in line with international practice as opposed to the NMA stance. Commending Gov. Ambode, Ahmed Yakasai, and Emeka Duru, National President and Secretary respectively of PSN, lamented that the state government has issued a circular approving the consultancy cadre which the Nigeria Medical Association (NMA) had kicked against. PSN however bemoaned the decision of the NMA for requesting the withdrawal of the circular. The duo of PSN National President and its Secretary told journalists that global performance index of healthcare sector is based on administrative prowess and not medical criteria. Both said the pharmacy consultancy cadre, as approved by Lagos State Government in the service of scheme is the best thing the health sector can achieve. According to the duo, Lagos State Government is absolutely in line with harmony and inter-professional needs to attain international best practices in the healthcare delivery system. Giving instances of countries with the best health care system like France, Italy, USA where the Health Ministers are not medical doctors, PSN reiterated that the worldwide performance index is dependent on neutrality and administrative prowess and not on ‘medical qualification’. “Incidentally, the Director General of World Health Organisation (WHO), Tedros Adhamon, an Ethiopian, studied Biology. If he, and all those above, were in Nigeria, NMA would have protested. “This is the situation the NMA of Lagos is attempting, and writing to a Governor as knowledgeable as Ambode Akinwunmi – a distinguished administrator who knows his onions and is committed to advance mankind. “The criterion for selection in these great and successful countries is based on professional and administrative experience and this is the same down the administrative structure. In Nigeria, the criteria for selection are solely based on MBBS qualification and it is also the same down the administrative structure. Does that tell you the reason(s) for failure? “PSN shall not relent in promoting the health sector in Nigeria. We commend the Lagos state Government for this bold action of international best practice”, the statement said. It said the barrier and superiority mentality has deepened the health sector woes in Nigeria, making the system poorly ranked among its counterparts in the world. “Among the 191 WHO member countries, Nigeria is sadly ranked 189 in healthcare service provision. It is very obvious that in Nigeria, healthcare service delivery is averse to change,” it further stated. The PSN body representatives observed that specialists and consultants in various fields in healthcare are a common trend across the world. They said, “Specialists and consultants are mandated to train and award fellowships based on their skills and competences. “These healthcare team members earn specialist allowances as they render services to the patients. In this current loggerhead, NMA said the consultancy cadre is sacred to only doctors (yet, citing certain international best practices). “We run Fellowship in the West African Postgraduate College of Pharmacists to improve our knowledge, attitudes, skills and competences to promote and maintain a high standard of professional pharmacy practice. “We have Primary level ( one year), Part One (two years) and Part two (two years). Pharmacists undergo a minimum of 12 months residency training and present dissertation that are assessed by erudite academics (Professors and all PhD holders), before the award of Fellowship in various specialties. “In fact, in the USA, a Nigerian (Dr Teresa Pounds- a consultant pharmacist) heads the Residency training and runs the consultancy program in one of the biggest Universities. Yakasai condemned NMA’s disposition on the recent creation of pharmacists’ consultancy cadre in the Scheme of Service of Lagos state. He said, “I read with utmost dismay, as NMA has turned both Judge and jury in its case. Representing all parties in the health sector. Deciding the fate of everybody and declaring others as they will. 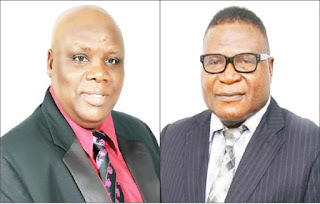 Reacting to NMA claims to power of regulating other professional in healthcare services, both PSN executives condemned the assertion. They asked rhetorically, “Can a Building engineer regulate the training of a civil engineer? Can an Architect tell government not to recognise the Master of Science of a Building engineer? “Nigeria is not and should not sink so abysmally. Other health professional have the right to develop themselves in line with best international practices-sincere practices please; not the one only NMA has access to. The interference with growth and development of healthcare in this country is becoming an embarrassment to civility,” they said.